Our stay in Reddersburg following the quick visit to Rouxville was even shorter, we just wanted to have a look at that 'two tower' church that we could see approaching the town. There was a bit more. 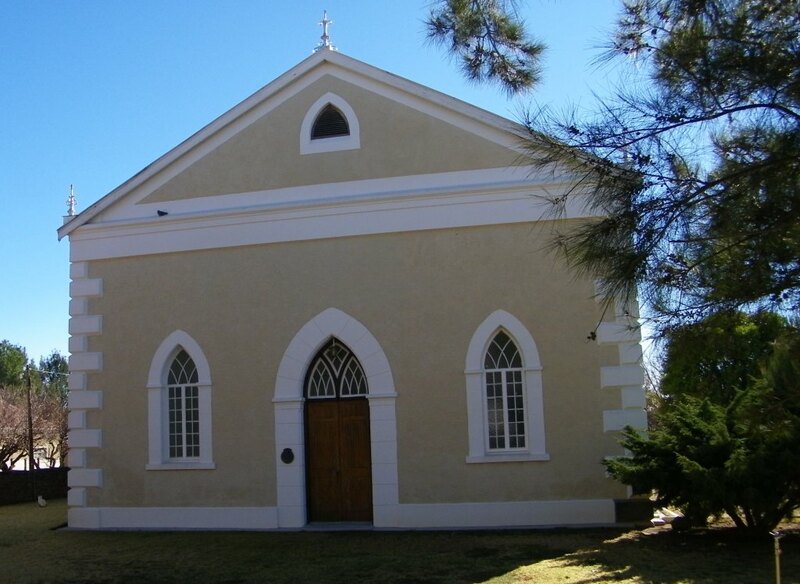 The town was established as a church town by the Gereformeerde Kerk (Reformed church), a off-spring from the Dutch Reformed Church. Some of the church history of the Nederduitse_Gereformeerde_Kerk can be found in this hyperlink. The farm Thorbeck was purchased for a considerartion of £1500 in 1859 to establish the town. The name is Afrikaans and means "Saviour's Town" because Jesus is the Saviour. Initially the town was administrated by the church and only became a municipality in 1894. An agreement had to be signed to pay tenure to the church of £33 per annum for ever after. From this website I gather that the amount now converted to Rand is still being paid to the church. Served as the church until the new, larger church was built. The cornerstone was laid in 1861 by Ds D.Postma who was the founder of the Reformed Church. That was the church with the two towers which attracted us to have a look at the town. 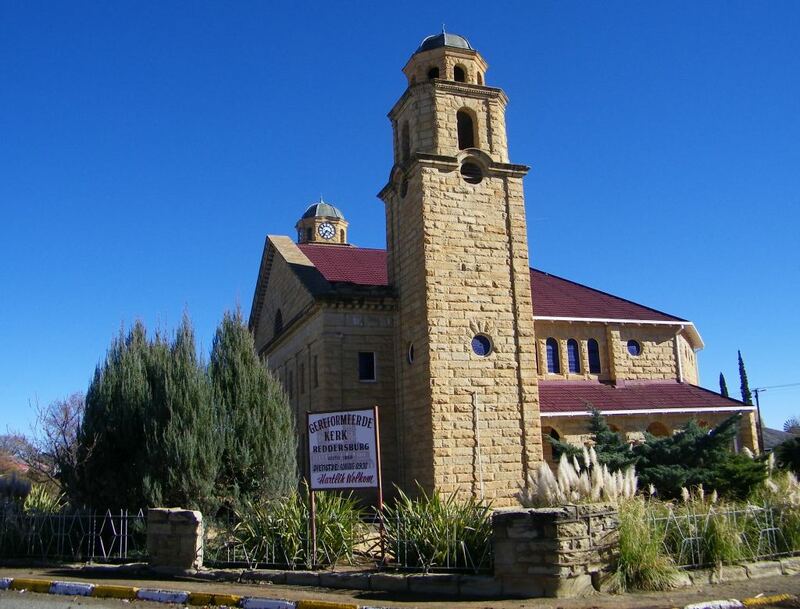 The church was build in 1925/27, the architect was Gerhard Mordyk, the same person that later designed the Voortrekker monument in Pretoria. A couple of British graves from the Boer war are found here. About the one in the picture of Captain Dimsdale I actually did find some information on the internet: Captain, 2nd Battalion, Royal Irish Rifles. Wounded Reddersberg, 3rd April 1900, died of wounds 9th April 1900 at Reddersberg. Aged 30. Born April 1870. Extract from The Last Post - Roll of Officers who fell in South Africa 1899-1902 by Mildred G Dooner, published by Naval and Military Press Dimsdale. - Capt. Wilfred Philip Dimsdale, 2nd Batt. Royal Irish Rifles, died April 9th, 1900, of wounds received in action April 3rd and 4th, near Reddersberg. He was the youngest son of the late Baron Dimsdale of Essendon, Herts, was born April, 1870, and educated at Eton (Mr. Rawlins’). He entered the Royal Irish Rifles Nov., 1889, was promoted lieut. July, 1893, and capt. April, 1898. From May, 1897, to March, 1898, he was A.D.C. to the late Lieut.-Gen. Sir Charles Nairne during the latter’s tenure of the Bombay Command. While holding this appointment Capt. Dimsdale took part in the operations on the North-West Frontier of India as Extra Orderly Officer to the General Officer Commanding the 1st Division of the Tirah Expeditionary Force, receiving the medal with two clasps. He embarked for South Africa in Oct., 1899, and served with the M.I. The one that really drew my attention was that of Dr. med. 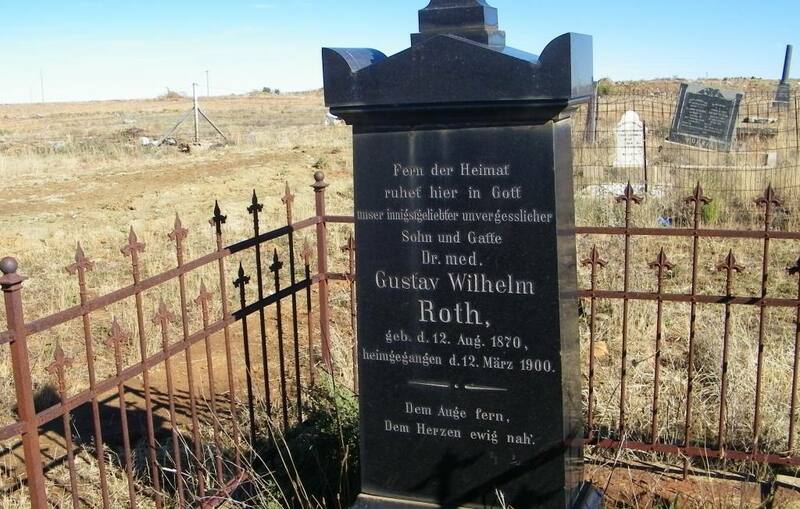 Gustav Wilhelm Roth, its all in German. 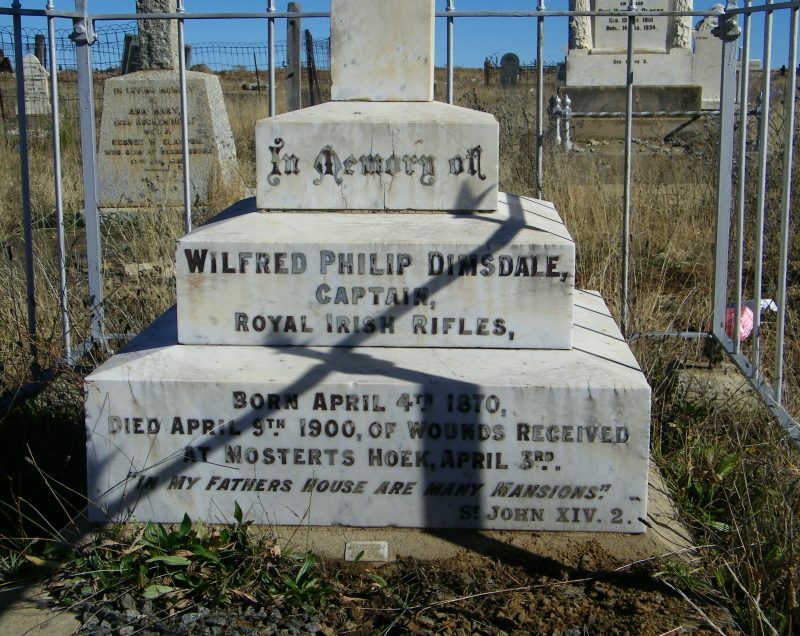 He died on the 17-March-1900, that was at a time when there was war action in the area (battle of Mosterts Hoek). I have searched the internet and some of my books but could find absolutely nothing.